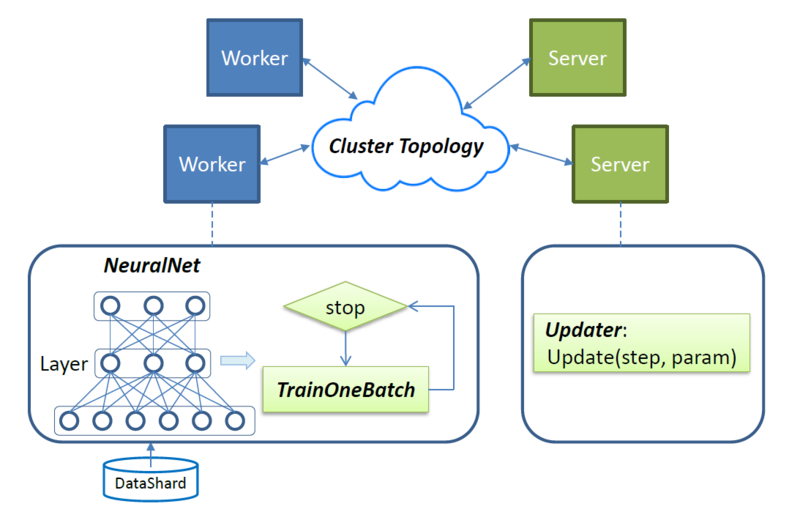 a Cluster Topology specifying the distributed architecture of workers and servers. The Basic user guide section describes how to submit a training job using built-in components; while the Advanced user guide section presents details on writing user’s own main function to register components implemented by themselves. In addition, the training data must be prepared, which has the same process for both advanced users and basic users. Figure 1 - SINGA overview. -resume is for continuing the training from last checkpoint. The MLP and CNN examples use built-in components. Please read the corresponding pages for their job configuration files. The subsequent pages will illustrate the details on each component of the configuration. initialize SINGA, e.g., setup logging. // parse resume option from argv. The Driver class’ Init method will load a job configuration file provided by users as a command line argument (-conf <job conf>). It contains at least the cluster topology and returns the jobConf for users to update or fill in configurations of neural net, updater, etc. If users define subclasses of Layer, Updater, Worker and Param, they should register them through the driver. Finally, the job configuration is submitted to the driver which starts the training. We will provide helper functions to make the configuration easier in the future, like keras. Users need to compile and link their code (e.g., layer implementations and the main file) with SINGA library (.libs/libsinga.so) to generate an executable file, e.g., with name mysinga. To launch the program, users just pass the path of the mysinga and base job configuration to ./bin/singa-run.sh. The RNN application provides a full example of implementing the main function for training a specific RNN model.